As you probably know by now, some serious wild fires are raging in the suburbs of Austin. 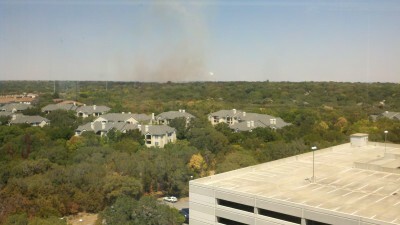 As you probably also know by now, from my former office in Austin I had quite the view, which allowed me every now and then to catch a glimpse of events around the area: a mall fire, a plane crash, etc. I just received this photo of the smoke from the nearby wild fires, taken from the top floor of MoPac C. Let’s hope they are controlled and extinguished soon. It can’t hurt to do a little dance for Tlaloc, either.